Ma Cipriani, inside the car, telling her son Toni that Giovanni Casa has stopped paying protection money after his photo was taken while wearing a diaper. Dead Meat is a mission in Grand Theft Auto: Liberty City Stories given to protagonist Toni Cipriani by his mother from her restaurant in Saint Mark's, Portland, Liberty City. Toni goes to his mothers restaurant to see her, but is again verbally attacked. Ma Cipriani complains that Giovanni Casa has stopped paying his protection money since Toni took a picture of him in his diaper. Although not pleased with Casa, she admires his guts for standing up to a Cipriani and tells Toni that she wished he had Casa's guts. Toni decides to get Casa's guts literally, and drives over to his delicatessen in Chinatown. Toni picks up Casa from his delicatessen and takes him to the Liberty City sawmill, where he intends on killing Casa. Casa remains unaware that Toni is about to kill him, until Toni starts the electric meat grinder. Casa attempts to escape, but continues to run around in circles within the Sawmill until Toni catches up with him and kills him. Toni puts Casa's body through the meat grinder and then takes the remaining flesh to Casa's own deli. The clerk decides to take the meat and sell it through the deli, with the clerk unaware that the meat is actually his boss Giovanni Casa. Toni Cipriani: Ma!... Ma!... are you there? Ma Cipriani: I ain't talking to you no more, Toni! You shame your Sicilian roots! 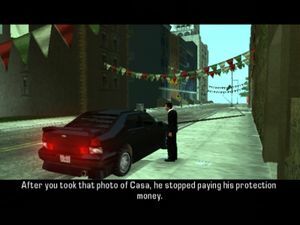 After you took that photo of Casa, he stopped paying his protection money. And what are you doing about it? NOTHING! Your father would have turned him into meatballs by now! Casa might be a bit funny, but it takes guts to snub a Cipriani! I only wish you had his guts! Toni Cipriani: You wish I had Casa's guts? Okay, Ma! You asked for 'em! (Toni drives to over to Casa's deli in Chinatown, meeting Casa). Giovanni Casa: Hi, Toni... how you doing? What's up? Toni Cipriani: You and me are gonna talk, Casa... Just somewhere more private. (Toni drives to the Sawmills, with Casa talking during the meantime). Giovanni Casa: So... er... where are we going? We're still cool ain't we, Toni? ...I'll get you the money I owe... honest! I just need some time! Does your Ma still like a spicy sausage? I can get her some, no problem! (Toni arrives at the Sawmills, and takes Casa inside for a 'chat'). Giovanni Casa: So... erm... what do you wanna talk about, Toni? Is it the protection money? It is isn't it? ...Toni? We can talk about this. Right Toni? Yeah! Yeah! Talking is good. People just don't talk enough these days, Toni. Toni Cipriani: Stand there and shut your yap, Casa. (Toni starts the meat grinder as Casa runs off, looking for an escape route). Giovanni Casa: Someone help me! Call the cops! Help! (Toni catches Casa and kills him, putting his corpse through the meat grinder before taking the meat to Casa's deli). Clerk: Special sausage meat delivery? No one told me about this! Woah! Which zoo did we knock-off this time? There's loads of meat back here! ...Mmmm! Tasty! Okay, I'll take them. It's a good thing Casa ain't here. If he finds out about this, he'll go crazy! The reward for this mission is $500. The mission No Son of Mine is unlocked. Giovanni Casa's deli can be accessed before taking him to the sawmills. Since the cutscene for this mission runs with the in game engine (like many others in Liberty City Stories), Ma Cipriani will sometimes run over a pedestrian while leaving her house. Toni Cipriani about to arrive at Giovanni Casa's delicatessen in Chinatown. Toni Cipriani talking to Giovanni Casa outside his delicatessen as a police officer looks on. Toni Cipriani driving Giovanni Casa to the Liberty City sawmill. Toni Cipriani and Giovanni Casa about to enter the sawmill. Toni Cipriani and Giovanni Casa walking through the sawmill. Toni Cipriani shortly before turning the electric meat grinder on as Giovanni Casa looks at the machine unawares. Toni Cipriani attacking Giovanni Casa with an axe. Toni Cipriani getting the van re-sprayed at Pay'n'Spray to avoid the police. Toni Cipriani returning the van back to Giovanni Casa's delicatessen, with Casa's remains (including the torso), visible in the rear of the van. Toni Cipriani watching as a delicatessen employee looks at the meat in the van. This page was last modified on 8 May 2015, at 23:35.